Dr Nicolaes Tulp (9 October 1593 – 12 September 1674) was a Dutch Surgeon and Mayor of the city of Amsterdam during the so called “Golden Age”. During this 17th century Amsterdam was the center of commerce and arts, with the founding of the world’s first stock market (“Verenigde Oost-Indië Compagnie”) and the rising of the Dutch school of painting. This was a prosperous time for the city of Amsterdam, during which the famous canal layout of the city was build. The career of Dr. Tulp matched the success of Amsterdam. As the population of Amsterdam grew from 30,000 in 1580 to 210,000 in 1650, Dr. Tulp’s career as a doctor and politician made him a man of influence. Thanks to his connections on the city council, in 1628 Tulp was appointed Praelector Anatomiae at the Amsterdam Guild of Surgeons. The praelector would give yearly anatomy lessons each winter, performing them on victims of public hanging. At that time in European cities, the dissection of bodies was only legal if the subject was a male criminal and considered outside of the Church. The dissections were performed with the consent of the city council and were a means to collect funds for city council meetings and dinners. All council and guild members were required to attend and pay an admission fee. Throughout Europe, these dissections were attended by prominent learned men, who exchanged ideas about anatomy and the chemical processes of the human body. The Amsterdam Guild of Surgeons, of which Tulp was official City Anatomist, permitted only one public dissection a year, and the body would have to be that of an executed criminal. To commemorate the dissection in 1632, the Guild commissioned a new group portrait of the prominent councilmen and guildmasters. Rembrandt, himself a young man of 26 and new to the city, won this commission and made a famous painting of the event: Anatomy Lesson of Dr. Nicolaes Tulp, which can be dated to 16 January 1632. This painting, which hangs in the Mauritshuismuseum of the Hague, depicts Tulp dissecting a criminal’s forearm. The criminal’s name was Aris Kindt. There has been much speculation as to why the dissection began on the forearm. This is possibly because current medical thought was concentrated on recent observations on lymphatics and ‘the white veins’. There was a popular anatomical Latin text on this subject by William Harvey, called Exercitatio Anatomica de Motu Cordis et Sanguinis in Animalibus, later expanded and corrected by Marcello Malpighi. In a dissection of a freshly hanged criminal in 1628 orchestrated by the French senator of Aix Nicolas Peiresc, a patron of the sciences and art, the chyliferous vessels were first seen in a human, because the unfortunate prisoner had eaten a copious meal before execution and the body was inspected only an hour and a half afterwards. The vessels were only visible to the naked eye when the subject had recently eaten. Rembrandt would later make another painting of Tulp’s successor in 1656 The Anatomy Lesson of Dr Jan Deijman. 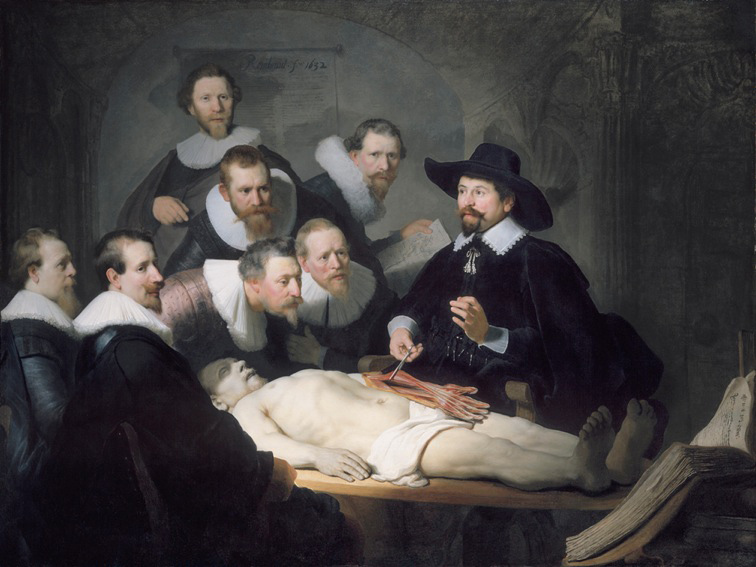 Since the painting of Tulp’s predecessor in 1619, The Osteology Lesson of Dr Sebastiaen Egbertsz was a group portrait around a skeleton, it is clear that the subject of a dead body had set a precedent. It would be yet another 100 years before the surgeons were allowed to dissect a female cadaver.